Yes, I know, along with my recent thoughts on Inglourious Basterds, I'm wandering off the horror reservation a bit. To be honest, I don't particularly buy much "new" product outside the genre, especially if it's science fiction. Uncertain why and no disrespect but I usually wait to catch stuff like this on television. Though District 9 was a gamble worth taking, as Neill Blomkamp's ambitious and exhilarating debut recalls the days when John Carpenter still had the midas touch. It could be likened to the sci-fi action cult classic (sans CGI) the director never made nestled between Escape from New York and The Thing. That comparison is meant in the highest of regards despite reading a few differing opinions that make a big stink over this quality reducing District 9's underlying, lofty messages on mankind. The narrative makes, at least starting out, a clear allegory to the horrors of Apartheid in the slum districts of a racially segregated Soweto next to Johannesburg. The commentary on this parallel between the corralled aliens and their brutal human overlords exists throughout, but really doesn't make much impact. If one didn't know of the Apartheid era going in, they still wouldn't be aware of the factual South African history behind the film afterward. Blomkamp seems more determined to craft what the marketing promises once we have liftoff and that's perfectly fine. It's hard to expect biting exposé in a film that features destructive, cat food lovin' aliens that misuse human clothing and have weaponry that turns said humans into exploding bathtubs of Ragù. Thought-provoking on varied levels, action-packed, and surprisingly "gooey" yet not too much of a preachy diatribe. A technical marvel on a budget with a fantastic lead performance by newcomer Sharlto Copley who channels a bit of young De Niro by way of Timothy Balme's Lionel from Peter Jackson's Braindead (Dead Alive). A long overdue successful notch on the bedpost for cult film lovers who just like to flirt with science fiction...and everyone else. 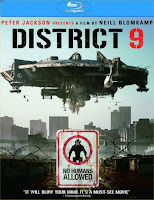 I wasn't expecting much from District 9 and the first 20 minutes or so had me thinking the entire movie was going to be a POV stinker, but once they get to the camp things got me interested pretty quick. By the end of the film I was blown away, I thought it was just amazing. YMMV since some people have a hard time just letting loose and watching something without digging for flaws, I myself can be guilty of this. District 9 was easily one of my favorites this year. Easily.